Lord of the Rings Glamdring, Sword of Gandalf. This item is being discontinued and is the last one available. 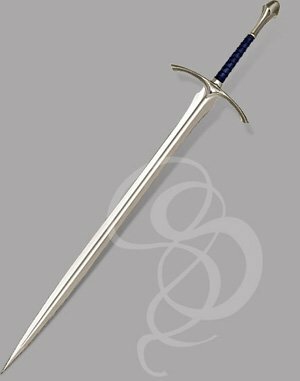 This is the sword Glamdring, which was weilded by Gandalf the Gray (and Gandalf the White) throughout the Hobbit and all three of the Lord of the Rings novels and movies. If you're into the hand and a half sword (and who isn't, really) then you have to appreciate the artistry that went into this sword. The sword is one of the most comfortable swords we've held. The luxurious leather grip cradles the hand perfectly and the oversized teardrop pommel provides an excellent counterbalance to the blade. The blade itself is made from 420 stainless steel and features a deep, long fuller that tapers quickly into a sharp point near the tip of the blade. This is an marvelous touch that gives the sword a little more malevolence. The cross and pommel are finished with an antiqued metal treatment that makes the sword look slightly battle-worn, but polished and bright at the same time. The cross guard swoops downward toward the blade, giving the sword a raptor-like appearance. It's a beautiful sword, perfect for hanging on a conspicuous wall or wearing as part of a costume. 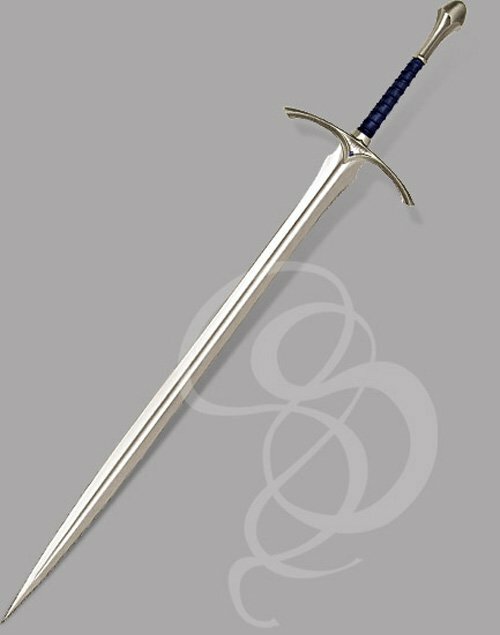 The sword comes with a decorative mounting plaque and a certificate of Authenticity verifying that you have purchased an officially licensed Lord of the Rings sword(this also verifies that the sword has gone through some of the toughest quality controls in the market). 35 5/8" 420 J2 stainless blade.